A compact linear test rig was designed and built to study the dynamics of in-line inspection techniques and defect characterization within a controlled laboratory environment. It consists of an inspection vehicle propelled by a 5.5 meter linear module having a toothed belt drive. An AC servo drive motor with a closed loop control unit operates the linear module. It is able to maintain a constant travel speeds up to 4.5 meters per second along the 2 meter test sample. The vehicle travel over a ball rail system and guide rail and is capable of high accurate and repeatable positioning. The vehicle is also able to handle various inspection technologies. At this moment the inspection vehicle is equipped with a magnetic flux leakage detection scheme, consisting of neodymium iron boron magnets and coupling steel brushes. The magnets have energy products of 18 to 30 mega-gauss oersted. It also has high sensitivity Hall effect sensors and a data acquisition system. Data acquisition is performed through a commercial mini-notebook attached to the vehicle equipped with a 16 bit analog to digital PC card converter having 16 input channels. Figure 1 shows a schematic drawing of the inspection system. To simplify the construction process a linear shape was adopted since it has no effect on the magnetic behavior of the system. Fig 1: Schematic drawing of the MFL inspection vehicle, top plate containing defects and rail system. The motor arrangement and data acquisition electronics are not shown. Defects with several shapes were inspected. Two samples are shown in Fig.2. They were fabricated with EDM technique simulating the shape of corrosion pits. The first one has a semi-spherical shape with 10 mm in diameter and 5.8 mm maximum depth. The thickness of the steel plate is 6.35 mm. The second one has also a semi-spherical shape with 8 mm in diameter and 1.9 mm maximum depth. Fig 2: Drawing of two defect geometries in a 6.35 mm plate. (a) The deeper one has 10 mm in diameter and 5.4 mm maximum depth. (b) The shallow one has 8 mm in diameter and 1.9 mm maximum depth. The corresponding measured leakage fields are shown in Figs. 3 (a) and (b) respectively. Note the difference of about one order of magnitude between the peaks of the magnetic field generated by the deeper defect and the magnetic field of the shallow one. Fig 3: Leakage signals due the two defects. Field shown in (a) corresponds to the deeper defect and field shown in (b) to the shallow one. 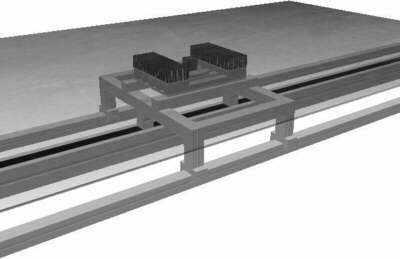 To recover the three-dimensional shapes of the defects a finite element model for the magnetic flux leakage arrangement was developed and validated experimentally . The inversion algorithm uses a sub-set of the model to estimate the geometry of the defect altering its mesh coordinates and using a least-squares routine to fit the magnetic leakage field generated by the model to the experimental data. The optimization flowchart is shown in Figure 4. The procedure starts by measuring the magnetic leakage field map Bri over the defect region. Then a finite element mesh is generated and solved for the initial coordinates that correspond to the surface of plate, i.e., for the situation where there is no defect on the plate. Once the mesh is generated and solved, the leakage field, Bi, is calculated over the defect region and compared to the measured magnetic field, Bri, in a least squares sense. If the error is bigger than a certain threshold, new coordinates are estimated using gradient information and the process starts all over again. If the new mesh coordinates generate a leakage field that correspond to the measured field, the process stops. Fig 4: Flowchart of the optimization routine implemented to reconstruct the three dimensional profile of surface-breaking defects. F stands for the error function. The results of the recovered geometry of the two defects shown previously are depicted in Fig. 5. The light gray area represents the search area of the algorithm. Also, the cross-section of the geometry recovered (line with circles) and the cross-section of the geometry of the original defects are shown, it can be seen that the maximum error is below 0.5 mm. Fig 5: Results of the recovered three-dimensional defect (a) deeper and (b) shallow. Profile of original and recovered coordinates for the same defect (c) and (d). A compact linear test rig having a magnetic flux leakage inspection tool was built and tested. Several samples with different defect geometries were inspected. Flux leakage maps were measured and used to obtain the three-dimensional shape of semi-spherical defects in 1/4" steel plates. The geometry obtained with the recovery procedure was in very good agreement with the experimental ones, with the maximum error being in the sub-millimeter range. The processing time was about one hour for each geometry. This work is partially supported by CNPq, FINEP-PADCT and PETROBRAS. Three-Dimensional Reconstruction of Surface-breaking Flaws Using Finite Element Methods. R. Schifini and A. C. Bruno, Review of Progress in Quantitative Nondestructive Evaluation, vol. 20 (in press).